Her name is inspired by a sweet country girl playing with the birds in the fields. and Obi to match this sweet Petite. There are red beads at the end of green strings on the Obi to look like adorable cherries. 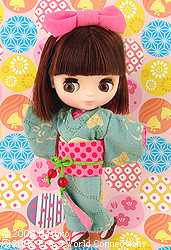 She wears Japanese style sandals which is a brand new shoe for Petite Blythe! Her hair style is a retro-themed dark brown bob. The big pink bow on her head adds a cute accent to complete her look! [ The set includes: ] Doll, bow, Kimono, Obi, sandals, and stand.